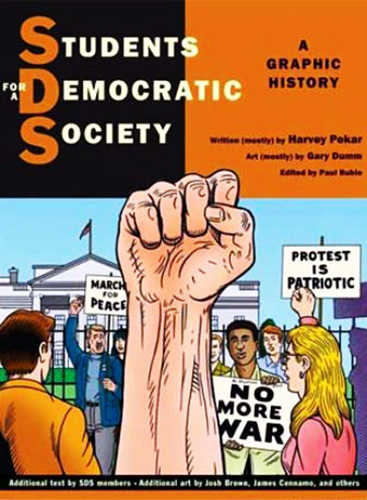 Written largely by alternative comics legend Harvey Pekar, “Students For a Democratic Society – A Graphic History” is a vexing text. Published in 2008, it breezes through a decade of radical organizing with moments of resistance narrated by witnesses to the history of the SDS. Along the way we learn the names, faces and stories of many of the most famous activists associated with the legendary student group, as well as some of their mentors. It is both a formal history and a collection of brief individual accounts, some spanning decades or a single afternoon, of former members of the SDS. In the whirlwind introduction to the SDS (and the general social upheaval in 1960s America) there begins a brief explanation of the founding of the organization. Names, dates, critical speeches and historic moments all help to illustrate this massive undertaking. It’s a lot to take in, so it’s a help to have the print copy on hand to flip through. There’s no doubt this book is the easiest way to track the timeline of events surrounding the SDS. This is especially helpful with keeping track of all the factions inside the movement. With competing groups of communists, anarchists, socialists and liberals vying for control of the organization, awash in a patchouli sea of turned on hippy hangers-on, this is very likely the quickest way to nail down the differences between Progressive Labour, the Revolutionary Youth Movement, the Yippies, the Hippies and the Wobblies (or Industrial Workers of the World). Sometimes a caricature is worth a thousand acidic words. One of the advantages to the individual narratives is that they cast light on the diverse politics of SDS participants. For example, a number of those presented in the book are anarchists, whose participation can be easily overshadowed by administrative cliques, organized factions and infamous splits, like the Weathermen/Weather Underground. If the IWW are absent from standard accounts of the SDS, they make repeat appearances here, demonstrating a continuity with older American radical movements. This is a place where the text shines, weaving the SDS into the longer tapestry of the American left. Still, one can feel a bit as though the tapestry has been dropped over their head, half finished, needles still in it and jabbing the reader as they struggle to make sense of it all. The majority of the book is individual stories, but they aren’t presented in any kind of unified structure, jumping around both the United States and the 1960s with no regard for causality. This portion also bears little resemblance to the first half of the book, meaning the skin to the central history’s skeleton is thin enough to show the bone beneath as often as not. 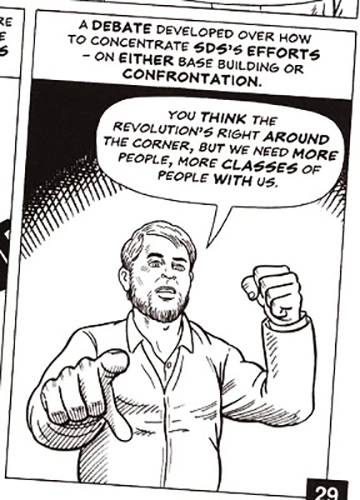 One striking problem is a failure to appreciate the essential purpose of the graphic novel as a medium for political education–and this is, admittedly, a general problem for political comics today that will only improve with time, thought, and conscious effort. But in this writer’s opinion, the comic consistently fails to achieve one of the basic rules of narrative: show, don’t tell. Many of the stories are pictures narrated by a speech bubble or floating head, precluding the chance of more text-and-image immersion. One particular entry, for example, is walls and walls of text with pictures to the side of it, a la Mad Magazine column. Such experimental formats in graphic art may push its boundaries, but they miss the mark for agitprop. Oral histories are meant to be spoken, and assailing the reader with walls of text breaks up the narrative and makes events difficult to follow. 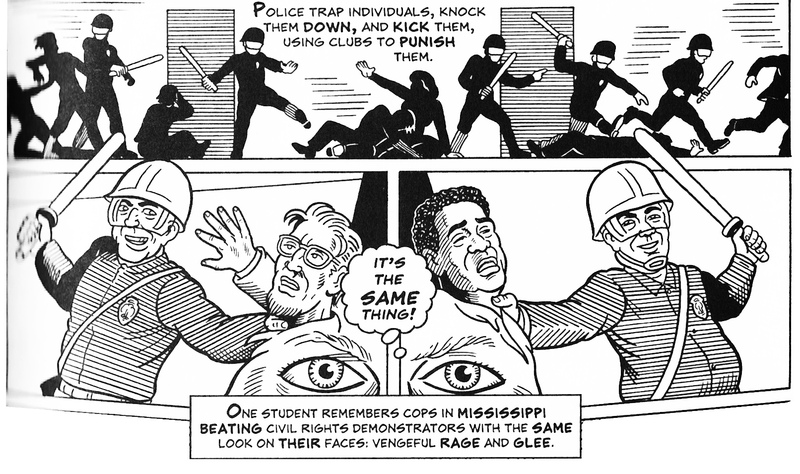 Ultimately, “SDS – A Graphic History” suffers from the same affliction as the organization it describes: bit erratic, confusing for newcomers, and lacking a unifying structure to make sense of its disparate narratives. One is quite possibly a result of the other, but the record remains somewhat incomplete for this dynamic, heterogeneous and at times very troubled group from an already intermittently incoherent era. It could suffice to say that 224 pages simply isn’t enough room to have offered more. But as a modern activist and a reader, I am left with a similar sense of both the book and the organization – there are invaluable lessons here that I can’t afford to ignore, but nonetheless struggle to decipher. Previous PostNew DC Superhero Based on Indigenous Youth Activist Shannen KoostachinNext PostFriday, March 21: It’s the Comix Equinox! Here’s the inside story: I agreed to script the story of the organization most important to my political life and realized I was too close to it; so allowed myself the back pages, reserving the narrative for Harvey P. I am not sure how it could have been done better. But the criticisms offered here are acute and mostly sympathetic. Thanks. Thanks for reading, Paul! The comic is one that I find myself recommending more than almost any other to friends and colleagues. It’s great to have the title available.